Toku Toy Box 5th Anniversary Announcement! Once again we’ve come upon the time of year we love most. Time for the members and staff of TokuNation.com to celebrate their respective holidays with their friends & loved ones. But it’s also time for TokuNation to celebrate itself. Our little community hits a major milestone this year, our 5 year anniversary!! January 4th 2017, will officially mark 5 years since TokuNation first went public thanks to it’s found Kickback! 5 years of growing & evolving into the open and fun community it’s become. As we’ve done in the past we want nothing more than to continue to grow this community. To strengthen the bonds it’s helped forge. To continue to bring you up to date news, rumors, images, videos, the occasional podcasts, and the welcoming community atmosphere you’ve all come to know. But we also want to bring you just 1 more thing. Our annual Toku Toy Box Giveaway! Like years past TokuNation is hosting an annual holiday giveaway open to ALL registered users! You’ll recall that in years’ past giveaways, users could post in a selection of galleries within the contest period to automatically be entered into the drawing for 1 of 4 prize packs. And this year is no different! To show our appreciation to you, the community, we’ve assembled 4 incredible prize packs spanning Power Rangers, Super Sentai, Kamen Rider, Ultraman, and more! Click “Discuss on the TokuNation Forums” at the bottom of this post to be taken to the OFFICIAL RULES and prize pack breakdowns of Toku Toy Box 2016! For now though, thank you. Thanks to all of you who continue to call this place your home for news, discussion, images, sales, friendships, artwork, videos, podcasts, and everything else in between. Happy Holidays from all of us, and best of luck in our giveaway! It’s our gift to you this, and every, holiday season! Thanks to some photos shared by the official NECA Toys twitter account we have our very first look at their next upcoming Godzilla figure! Slated for an early 2017 release is none other than Shin Godzilla! We only have the few display images provided by NECA to work with at this time, but Shin Godzilla is already looking like one of their best releases yet! We’ll keep you up to date as more info becomes available for this release. BigBadToyStore.com Black Friday Sales Event – Legacy Items on Sale! Our site sponsor BigBadToyStore.com has a MASSIVE Black Friday Sales Event going on throughout this weekend! If you’re a toy collector of any kind you do NOT want to miss out on some of these great deals! And, as always, for those only interested in tokusatsu we’ve listed those below! Check it out! Toku-Related Black Friday Sale Items! And of course there’s more! To check out the full product listing, click the following link – BigBadToyStore.com Black Friday Sales Event! Better hurry – the sales all end on Monday night (or when the item is out of stock)! BigBadToyStore.com Black Friday Sales – Legacy Dragonzord, Dragon Dagger, and More! Great news for those holding out to pick up your Legacy Dragonzord or Legacy Dragon Dagger! Our site sponsor BigBadToyStore.com is holding a Black Friday Sale starting RIGHT NOW until December 1st, 2014! Check out these great deals!! This an incredibly great opportunity to pick up some of these figures at the lowest prices EVER! Don’t forget to take advantage of their Pile of Loot system to save more with your shipping! To check out the entire Black Friday List, including other great properties like Transformers, The Walking Dead, Marvel Super Heroes, DC Super Heroes, and more – simply click here! Our sister site ToyArk.com has put up an impressive gallery of the NECA Godzilla 2014 figure! 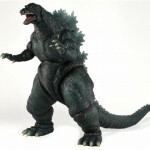 The King of Monsters looks imposing and is highly detailed with a very impressive sculpt. We’ve mirrored some of the images in this news post. Check out the full gallery by clicking here! Don’t forget to check out our sister site ToyArk.com for everything that isn’t tokusatsu related! You can follow them on Twitter @ToyArk as well as on Facebook by simply clicking here! After seeing some prototypes in the last month NECA has finally unveiled their 2014 Godzilla in all it’s glory! This beast is about 6″ tall measured from head to foot, and 12″ long from head to tail. This formidable beast is the first really nice representation of the character we’ve seen so far in toy form. Featuring 25 points of articulation including a bendable tail this bad boy looks to be the figure to beat until the eventual S.H. Monsterart is released! Check out all the images of Godzilla by clicking “Discuss on The TokuNation Forums” at the bottom of this post! And don’t forget that Godzilla destroys theaters on May 16th! 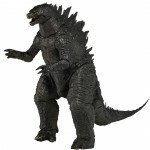 NECA has revealed the first images of their Godzilla 2014 figure offerings! The painted figures you see are that of the approximate 6 to 7 inches tall and 12 inches long variety, while the resin prototypes are for the larger 12 inches tall and 24 inches long figures. Many of these figures are estimated to release in May, and assumed pricing can be seen through our site sponsor BigBadToyStore.com. And thanks to ToyArk for the heads-up! 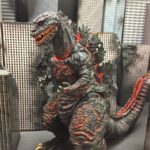 Site sponsor BigBadToyStore.com has put up some listings of the upcoming NECA Godzilla figures, which act as the first true revelation of what exactly we’re getting, along with a concept image of their classic Godzilla figure. Check it out! For those who aren’t in the loop, for tokusatsu fans NECA is best known for their figures from the Pacific Rim movie. What do you think? Will you be purchasing these figures as an alternative for S.H. MonsterArts? Sound off in discussion!